Sound, audio player, headphones, custom wall-mounted acrylic bookholder, screws and a copy of The Door to a Secret Room: A portrait of Wells Coates. 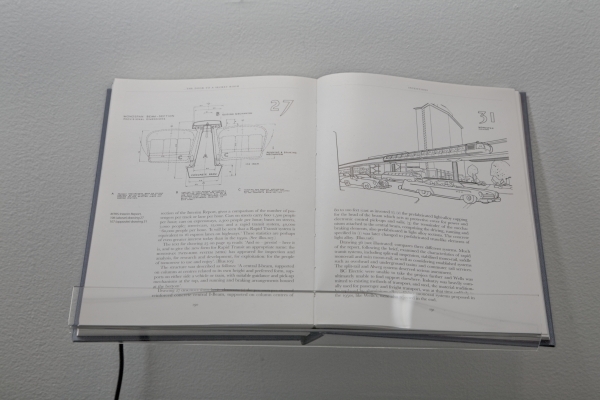 A book sits on a custom acrylic holder, open to a page describing Welles Coates' 1957 proposal for a monorail system for Vancouver. In the accompanying soundtrack, which is presented on headphones, a calm modulated female voice is layered to produce a portrait of the Skytrain, Vancouver's contemporary metro system. The voice is that of Karen Kelm, who was employed by BC Transit when the Skytrain was built for Expo 86. Word in the office was that Kelm had some theatre experience, and so she was asked to record thenew transit system's station announcements. While in Vancouver in 2008, I tracked her down and she agreed to help me make this work. I asked her to listen to a sound collage I had made of recordings of the Skytrain and its surroundings, and to describe what she could hear. The sound element of the work was originally produced for the exhibition The sound I'm looking for (part 1) at the Charles H. Scott Gallery, Vancouver, October 2008, which was curated by Cate Rimmer. Supported by Culture Ireland. skytrain/monospan twin ride was shown in the group show Timespace at the Burren College of Art from August to September 2009. Curated by Martina Cleary and Jerome O'Drisceoil.